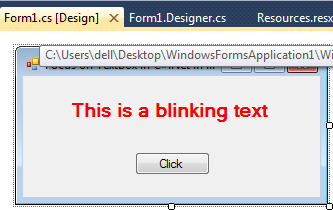 This article will show you how you can create a blinking text in windows application using C#.net. 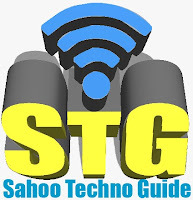 in this article I have start text blinking on button click. Some of my previous articles are as follows: Error Handling in Windows Application Using C#.Net, Confirmation Message on Button Click and Capture YES/NO Click by User in Windows application, C#, Dynamically Add Textbox Control in Panel and Clear All on Single Click Using C#.Net in Windows Application, Dynamically Change Form Background Color C#.Net in Windows Application. 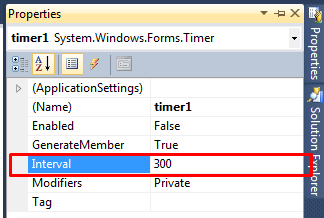 In this article first we will create a new windows application and add button label and a timer control. Now set the timer control interval to fire. In above I have enabled the timer control on button click and now in I have generated the code to blink the text. In above code I have assign the max blink count of the text. After reaching the max no of blink count text blink will stop.